In a previous article (“How You Can Save Science: Why the Federal budget cuts are bad for Penn’s scientific innovation” by Shaun O’Brien, Guest Column, February 15, 2013) in the Daily Pennsylvanian, Shaun O’Brien of the Penn Science Policy Group discussed how budget issues may affect science funding. O’Brien sent an email update, giving more detail on how postdocs might be impacted by NIH budget issues, and what we can do about it. First, thank you again for your support with our Hill Day visit last week. We had 30 students and 2 faculty members participate, and we were able to meet with Congress members and staffers from multiple states. The Daily Penn did a recap. On Saturday, the House of Representatives will be debating a short-term funding bill that has been revised by the Senate. If they fail to agree on the revised bill, there will be a government shutdown. There are multiple outcomes that could happen in the next 48 hours (including another short-term bill to fund the govt for a week), but this is an important time for our House and Senate members to hear from us. A Govt Shutdown would result in no new grants being issued or contracts being awarded, while the shutdown is in effect. The last shutdown was for 3 weeks in 1996. The biggest concern would be a “compromise” funding bill that could include additional spending cuts. Additionally, debt ceiling talks and discussions on the sequester will also be starting up this Fall-thus, we need to contact Congress to let them know about the importance of protecting NIH funding. I would strongly encourage our students and faculty to contact the following PA members of Congress (if you vote in those House districts) and tell them that it is important to protect NIH funding during this current budget debate. This is especially important to do in the next 48 hours. Thank you again for your support and effort. Our efforts this Fall will be especially important to our careers in science, as the Federal Govt needs to be encouraged to continue to invest in science and not move away from funding the NIH. Please, share the message below with your e-mail lists. If you are a PhD student or postdoc in the sciences (and that includes engineering, biology, chemistry, and physics) and want to apply your knowledge, experience, and skills outside of academia (or simply see what opportunities exist out there), then make sure you take advantage of this opportunity to directly interact with employers at this fair. There is no need to pre-register, just turn up with your PennCard on the day and you will be able to network with former Penn postdocs, Penn alumni, recruiters, and other employers representing their organizations. Students and postdocs who have attended this event in the past have successfully found the jobs they were looking for. Be one of the 300 PhD students and postdocs who attend this fair each year. · Global Prior Art, Inc.
· American Association for Cancer Research, Inc.
We are extending the Biomedical Postdoctoral Council sponsored blood drive until Friday, September 27th. So please get your friends, lab mates and PIs to go and donate blood. There is a regional shortage of blood & your donation would help treat HUP patients. 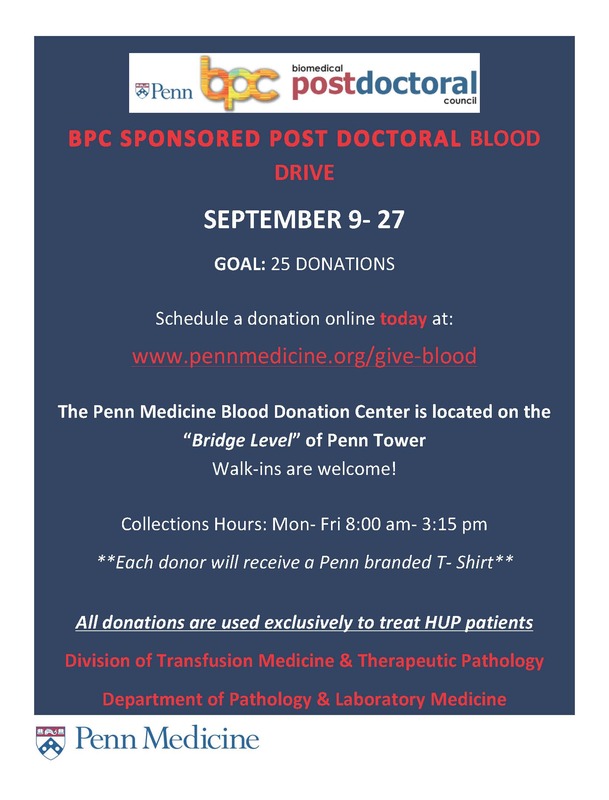 All donors will receive a Penn branded t-shirt! All donations are used exclusively to treat HUP Patients. This week marks National Postdoc Appreciation Week. The BPP and BPC are organizing a number of events to celebrate – please join us! To kick off NPA Week, Dr. Michael Kalos will be giving a talk on Monday, September 16th, 2013 from 3:00 – 4:30pm. The talk is titled: “Application of Synthetic Biology to Treat Disesase: The T-Cell Immunotherapy Program at UPenn,” and will be followed by a reception for CHOP and Penn postdocs. Speed Networking Event! Get to know other postdocs, socialize, or talk about experimental techniques and ideas. Snacks will be served, and there is a chance to win gift cards. Contact bpc.social at gmail dot com to register. BRB14, 1-3 p.m.
BPP and selected faculty and staff will be serving up ice cream to our postdocs on Thursday, September 19th from 2:00 – 4:00 pm in the BRB faculty lounge!